Probably around thirty years ago, I came across a football programme, I’m not sure how I acquired it, but it caught my eye because I’d never heard of the home team, despite considering myself to be an oracle of non-league football, even at fifteen years of age. The club was Illogan Royal British Legion, it was from 1972 (the year of my birth) and it was for a friendly game against Crystal Palace, who in hindsight were probably on something of a pre-season vacation in the South West. It involved some research back then in pre-internet days and by using some old non-league directories I found a side that had been in the South Western League, and indeed the FA Vase during the mid to late Seventies. Ok, so it was in the South West, but where precisely? Atlas time (ask your parents kids), and it came to light that Illogan was a village on the edges of Redruth in Cornwall. But from a footballing perspective, at the time I looked into them, they were playing in the Cornwall Combination. To be fair I’d never heard of the Cornwall Combination, so please forgive me Illogan, but because I couldn’t see you in the South Western League tables in my most up to date directory, I kind of assumed you’d gone belly up and disappeared. Ok, I claimed to be a font of knowledge, but it only went as far as the publications at the time allowed it to go. 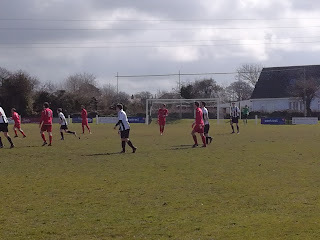 Every few years I’d have a sort out of the programmes, moving house three times was usually the trigger, and more often than not the Illogan issue would re-appear, but once again, it would end up being filed between Ilkeston Town and Ilminster Town. 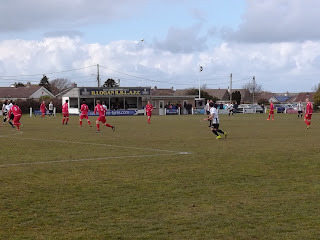 But then, like a phoenix from the flames, I was perusing the usual non-league football websites as I regularly do, when I read that Illogan had been accepted join the South West Peninsula League. So, they did still exist after all, and apparently if I’d made the point of looking at the Cornwall Combination history then I would have picked up on the fact they’d won it four times in the previous eight seasons. It seemed a sleeping giant had awoken…..
I’ll be honest though, and I’m not going to lie and tell you that a flame had been ignited and I had a burning desire to go and watch them play. It was a more a case of some old curiosity being settled, and that programme was part of something that still existed today, it just took me a while to find it. Yep, from that point onwards I kind of forgot about them, until recently when I was trying to put together the fixtures for our Cornish trip. 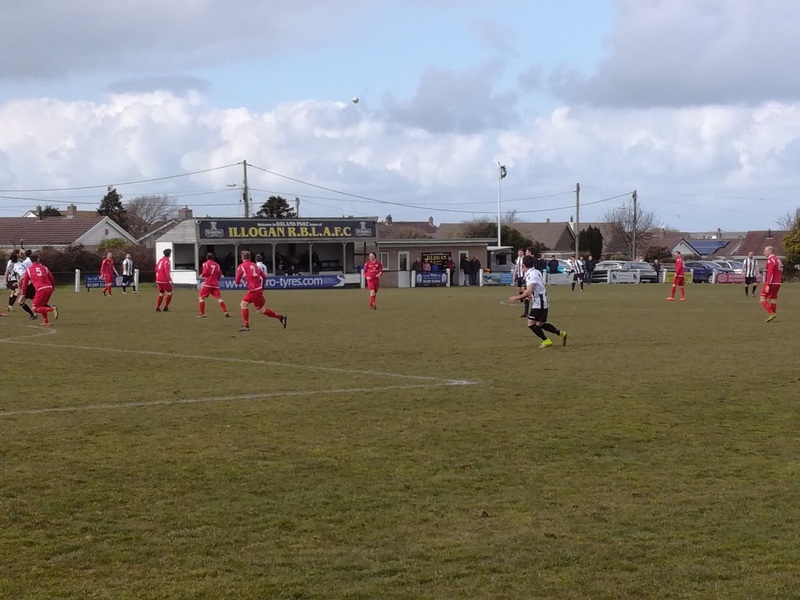 You see, because so many games were scheduled to be played on the Good Friday, Easter Saturday was looking a bit barren, and the only game I could find that was a realistic option was indeed Illogan RBL v Wadebridge Town. If that went by the wayside, somewhat ironically, it was going to have to be the Cornwall Combination! Naturally the weather was going to be key, but the plan was in place, we decided to drive up to the wonderful St Ives for the morning, and it was while Mrs H and Junior H were having a paddle (I’m not that daft – freezing cold – weaver fish – sand between the toes – no thanks) that I saw a tweet that said the game was on. Oh days of happiness! Once we’d navigated our way out of a very busy St Ives (I’d hate to go when it’s a nice day) and got back on the A30, finding the ground was fairly simple. 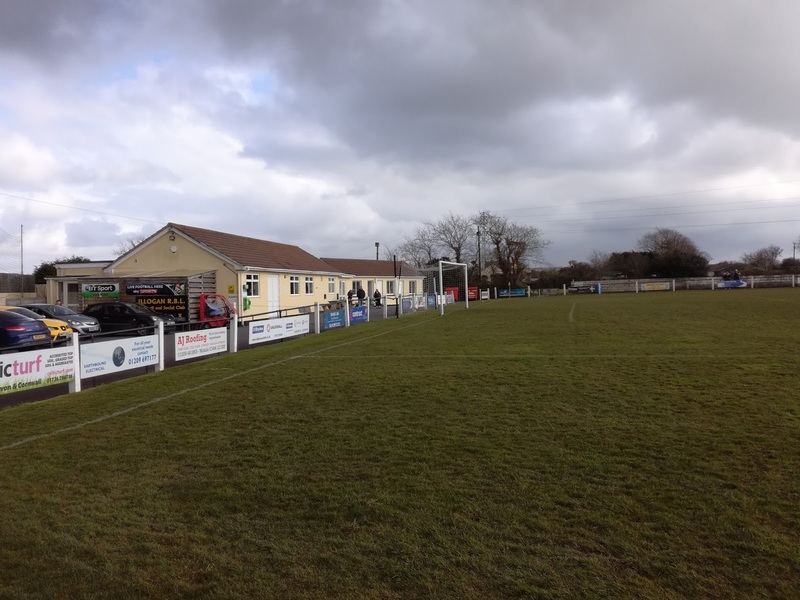 Oxland Park sits close to the centre of the village, which in itself is just North of the dual carriageway, and to be fair it probably sits equidistant between Redruth and Camborne, although it does seem to associate itself more with the latter. What a lovely little ground. An old bench seated stand sits on the half way line, with a small tea bar to the side of it, while behind the goal stands a very smart clubhouse (Royal British Legion to be precise) and the requisite changing facilities. 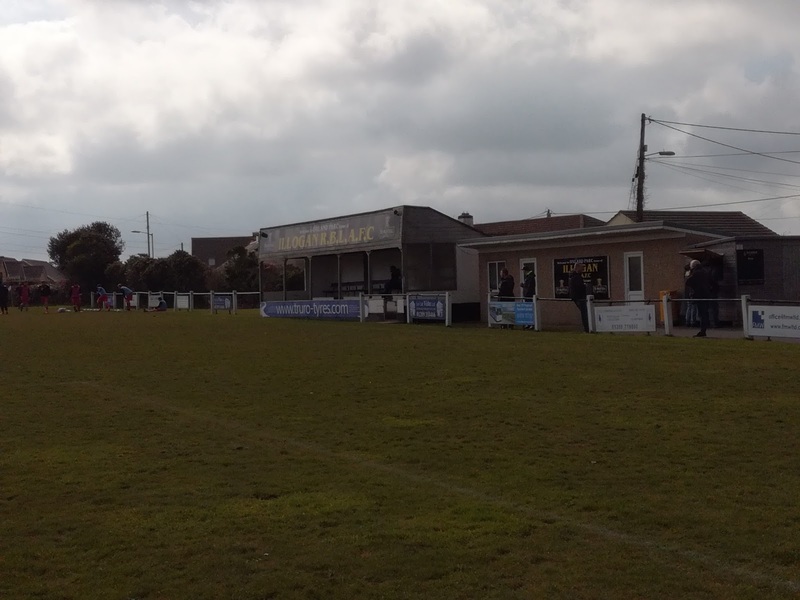 It was very different to what I’d encountered before on this trip, but I got the sense that this was a typical Cornish football ground. Yes, I was happy, and even happier with a pint in hand, while the locals were friendly and chatty. I’ll be honest, the game was awful. It finished 0-0 and probably would have still been goalless if we’d played until Easter Monday. Both sides had the endeavour, but they didn’t have the craft and guile on the day to fashion a goal. No criticism is intended of either side, but sometimes you just cancel each other out and that’s how it develops. But, after twenty minutes played I thought a goal looked unlikely, and that feeling only grew as the game wore on! 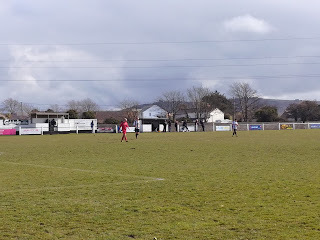 But, I liked Illogan, it felt like a trip back in time, almost like a trip back to the old South Western League that I overheard some locals lamenting the loss of. I haven’t anything like the local knowledge they have to be fair but I’m not sure what the difference is between that and the Peninsula West? Other than maybe it’s perhaps not as strong? Bodmin Town’s game was on it was too late to make it. Bude Town was an option but the travel time and the risk factor with the weather meant it would have to wait for another day. But that was Cornwall, what a superb experience, what a great holiday, and what a way to spend your honeymoon. I would strongly recommend it, if you think you can get away with it!